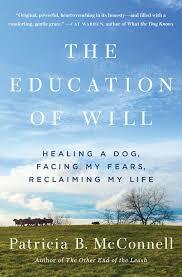 Come meet author Patricia McConnell as she talks about her book, The Education of Will. For decades, animal behaviorist Dr. Patricia B. McConnell grappled privately with intense fear, anxiety, and guilt. In this soul-searching memoir, she recounts for the first time the compelling story of her past and how a dog named Will helped her recover from a history of trauma and shame. Patricia is forced to face her past by her love for Will, a young border collie whose frequent, unpredictable outbreaks of fear and fury shake Patricia to her core and trigger memories of three harrowing traumas and a shameful secret. In order to save her dog from his problem behaviors, Patricia must first address her own long-buried emotional pain. As she does, she learns that willpower alone is not enough to heal. Written with “a gentle, comforting grace,” (as said by one reviewer), interweaving her work with troubled dogs with tales of her deepening bond with Will, The Education of Will recounts Patricia’s fight to reclaim her life—and relieve Will’s fears in the process. Their journey reminds us that, while trauma changes our brains and the past casts a long shadow, healing is possible—for both people and dogs.